After 80 years, it's here-the one thousandth issue of DETECTIVE COMICS, the title that literally defines DC! This 96-page issue is stacked with an unbelievable lineup of talent that will take you on a journey through Batman's past, present and future...plus a sensation epilogue that features the first-ever DC Universe appearance of the deadly Arkham Knight! But who is under the mask? And why do they want Batman dead? The incredible future of Batman adventures begins here! This soon to be key issue will be CGC GRADED at a high 9.6 or higher!!!!!!!!! fThis is an incredible offer, and a truly Marquee item! There will be less than 50 of these! Ready? 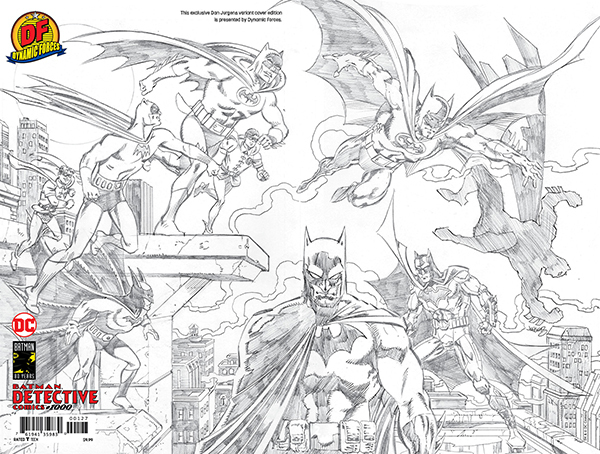 The Pure Pencil cover by Dan Jurgens where you see all of the Batman through the ages, in PURE PENCIL FORMAT by the man who helps celebrate 80 Years of Batman on this Detective #1000 cover!!!!! If you're a CGC Fan, and wanted the coolest Limited Edition Comic Graded with the ease of just ordering, DF has it for you right here! Guaranteed 9.6 Grade or higher, these come straight from the company that brought you this limited edition cover and CGC!!!!!! FINAL COVER MAY VARY. ALLOCATIONS MAY OCCUR.